Your garage door springs are essential to the correct functioning of your garage door. If you've noticed significant wear or damage to your springs, it is essential that you call our professionals straight away. Spring failures usually happen when the door is in use - when a spring snaps nearby a person or object this can be extremely dangerous due to the level of tension that suddenly gets released. For this same reason, it's important you don't attempt to fix your garage door system's springs yourself. Don't risk your own safety! Extension springs are located on either side of your garage door tracks – they extend in order to close the garage and contract when the door is opening. If you're in need of a new extension spring, these are very tricky to fit and need to be handled by a qualified technician with the correct tools and know how. 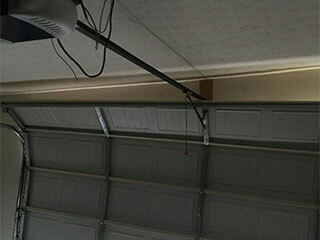 A torsion spring is located above the opening of your garage. When these springs are installed, they're wound up very tightly, meaning they come charged with a lot of potential energy. Due to the constant pressure, these springs tend to be where damage most often occurs. Attempting to handle repair or replacement of these springs in particular is extremely dangerous, even in the hands of a skilled technician with the right tools. Please do not attempt to tinker with this component without the assistance of an expert! Garage door springs are designed to be durable, but without the proper maintenance they may start to fail earlier than necessary. Signs of this can be wobbling or squeaking when the door is opening and closing – whether you've identified issues with your springs or not, we recommend booking a maintenance inspection with our technicians if it's been a while since your system was looked at. Our experts will provide any lubrication or adjustment that's needed there and then. Whether you're in need of spring maintenance, repair or replacement, our experts can help – contact us today to book your appointment!